For its entire history, JetBlue’s TrueBlue has been a frequent flyer program also-ran. The program has been hobbled in two ways. First, it’s a bare-bones program. Members only earn points on JetBlue flights and for charges to the program-affiliated credit card. And those points can only be redeemed for JetBlue flights—there are no hotel, rental car, or other airline partners. Second, and more egregiously, TrueBlue points expire after a paltry 12 months—except when members use a JetBlue credit card, which extends the life of points by an additional 12 months. Yesterday’s email from JetBlue—headlined “Announcing the newer, truer TrueBlue”—promises a new program, debuting this fall, that both addresses those shortcomings and fundamentally restructures the scheme’s approach to earning and redemption. The word ‘relaunch’ is used repeatedly, indicating that this is a ground-up do-over, not just an isolated policy change or tinkering at the margins. Indeed, except for the name, the new program will be just that: a new program. Taking a page from [% 2749856 | | Virgin America’s %] playbook, the new TrueBlue will be a revenue-based program. So instead of awarding points for flights or flown miles, the program rewards members with three points for every dollar spent on JetBlue tickets, plus an additional three points if the tickets are purchased on JetBlue’s website. Until JetBlue releases full details of the new award chart, it will be impossible to assess the new program’s core value proposition. After all, any program’s bottom line is how many times you have to fly—or how much you have to spend—to earn a free flight. So, like most major carriers, the life of points may be extended indefinitely with any partner transaction. Unlike other programs, though, TrueBlue’s limited partner roster means there are only two types of transaction that trigger an expiration reset. Still, this is a step in the right direction. JetBlue hasn’t officially confirmed this, but based on the airline’s current marketing relationships, I’d say there’s a very strong possibility that Lufthansa will become an earning and awards partner, and a slightly lesser possibility that Aer Lingus will be added to the partner list as well. 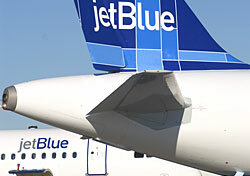 I’ve scolded JetBlue repeatedly for offering its customers such a lackluster program, once dismissing TrueBlue as “a parody of what a loyalty program should be.” While the new program doesn’t break any new ground—as might reasonably be expected of an airline that has done such an exemplary job of exceeding consumers’ expectations in other areas—it at least gives JetBlue a credible counter-offer to the programs of Southwest and Virgin America. So if I were asked to suggest a new name for the updated TrueBlue, I’d stop short of TrueBluePlus. For now, let’s just call the new program BetterThanAPokeInTheEyeWithASharpStick.